Ford has revealed the first details of the all-new Mondeo which will go on sale here in early 2013. While the overall shape is similar to the current Mondeo, it has a sleeker profile plus a new front end, similar to the forthcoming Focus ST. The interior is more spacious with new seats, a higher centre console with more storage and extra passanger space. This has been improved by moving the dashboard nearer the windscreen. Ford is also promising improvements in quality with interior surfaces that are softer to the touch, while panels gaps have been minimised. Improvements have also been made to the already acclaimed handling with specially tuned electric power-assisted steering plus a MacPherson strut front suspension and an all-new premium-level multilink rear suspension – similar to Audi and BMW set-ups. There aren't too many details about the UK line-up yet but the new Mondeo will be available with the usual diesel and petrol engines plus there will be a hybrid and even a plug-in hybrid version. The petrol line-up will include the impressive 1.6-litre and 2.0-litre EcoBoost units available with Ford's latest PowerShift automatic gearbox. 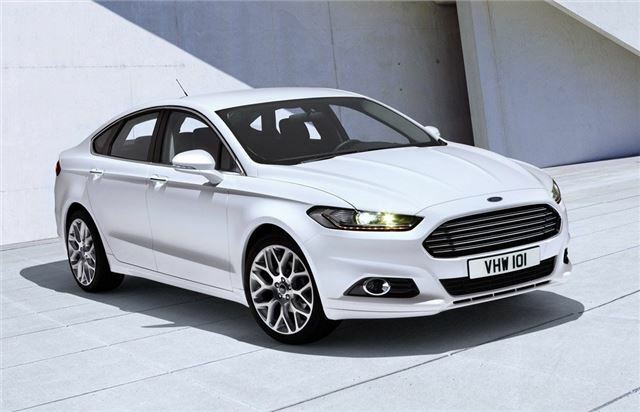 The Mondeo Hybrid will be powered by a 2.0-litre four-cylinder petrol engine and can run on purely electric power up to 62mph. Meanwhile, Ford says that the plug-in Mondeo Hybrid will be the most fuel efficient family hatchback in the world with economy more than 100mpg. Both hybrid versions are fitted with active noise control which uses the audio system to block out road noise while 'enhancing' engine sound. Other new features on the forthcoming Mondeo include a lane keeping system which uses a small, forward-facing camera to monitor lane lines. The system will alert a driver if drowsiness or erratic lane-keeping is detected with steering wheel vibration if the car drifts too close to lane markings. It will also actually apply pressure on the steering to help bring the car back into proper lane position.